No sign up is necessary. Any SLSD Jeep Invasion participant meeting the qualifications below can compete in the SEMA Young Guns competition. It’s easy – just visit the SEMA Corral during hours listed below and have your vehicle judged! It’s that simple! Built their own 4x4 or primarily did most of the work themselves. Judging will take place in the SEMA Corral on Saturday from 10:00 am – 4:30 pm only. You’re welcome to hang out there all day, or once the judge has initialed your judging card to let you know he’s evaluated your vehicle, you’re welcome to leave the corral. Please try and stay with your vehicle in the corral as much as possible – the judges would love to meet you and hear your build story. 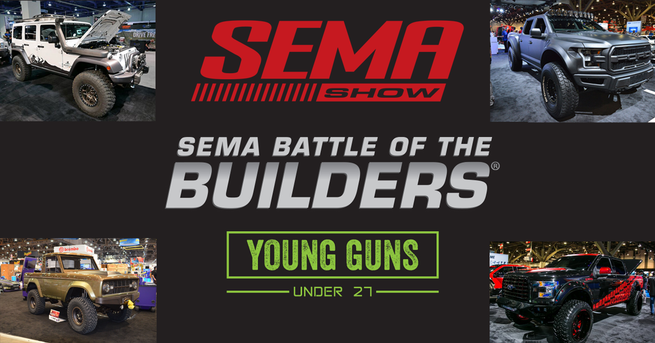 To be eligible, you must attend the Saturday, June 2nd participant award ceremony to see if you’ve been crowned as the top SEMA Young Gun winning the grand prize! One participant will be selected this weekend from all eligible entries to win the grand prize.